I’ve tried seat savers in the past. I’ve owned sheepskin ones, a Cashel seat saver, a Thinline seat saver . . . none of them really worked for me. It was a Goldilocks kind of situation. Some were two thick, which changed the way my saddles fit (making them slightly too small). Or they moved too much on the saddle, which felt insecure, or they just didn’t improve the comfort enough. When Country & Stable asked me if I’d like to try a product and write about it, the Acavallo seat savers immediately spoke to me (although it was hard to choose because they have a lot of cool products). I’d just purchased the Acavallo Arena Stirrups and I like the quality of their products. Imagine my delight when they sent me two: the Acavallo Gel Out Cushion Ride Seat Saver and the Acavallo Gel in Seat Saver. One for each horse! 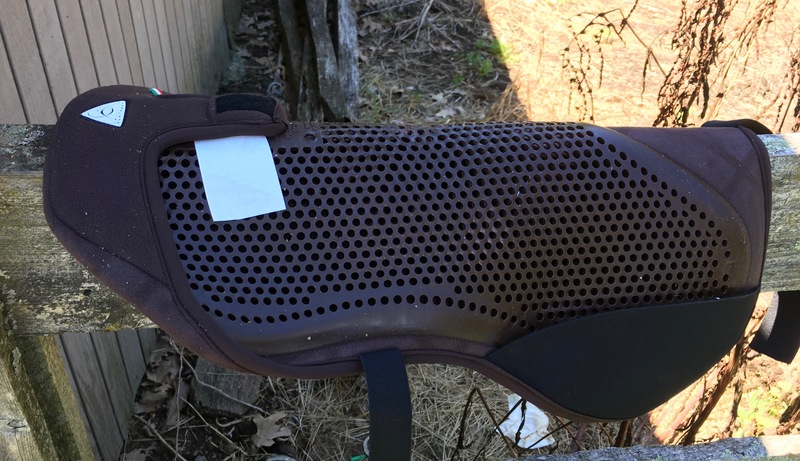 They attach to the saddle using a strap that goes from front to back and with pockets for the skirt (the flaps the cover the stirrup bars). This is a much better design than some of the ones I’ve tried before which you needed to tie to the D rings or which use elastic side straps. Those never stay put and the one thing less comfortable that riding without a seat saver is having one get twisted under your leg. They cover the seat of the saddle completely. Each model has a good layer of gel. Definitely they looked comfortable! Here’s the underside of the gel-in pad. You can see the pockets for the saddle skirts. The pads arrived without instructions. After all, how hard can it be to put on a seat saver? Mostly, attaching them to my saddle was straightforward. You put the saddle skirts in the pockets, then bring the strap from the pommel to where it attaches at the cantle. The velcro closure for the strap under the saddle is secure. 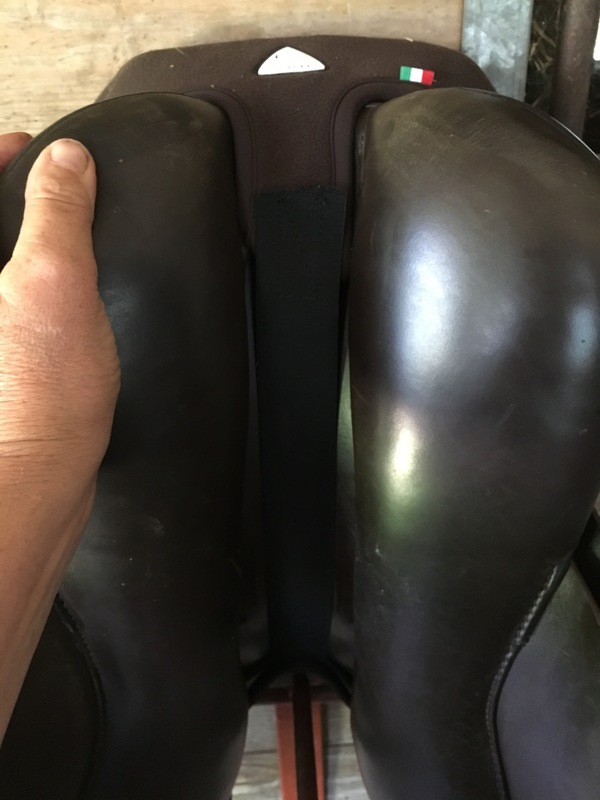 I’ve ridden several times in each saddle and have had no problems with the strap coming loose. Because of the pockets for the skirt flaps, the pads also have lateral stability. A strap passes from the pommel to the cantle and attaches with velcro. There was only one mystery when setting up the pads. There are two straps on the rear of the pad which completely baffled me. Luckily, I’m not the first person to have this question and Google helped me understand that these straps are designed to be tucked under the panel of the saddle, into the gullet. Some people find they don’t need them and choose to cut them off. I tucked mine in under the panel and they seem to be fine. Certainly, they didn’t bother my horses and they stayed put. What to do with this strap? There’s one on either side and it didn’t appear to connect anywhere! 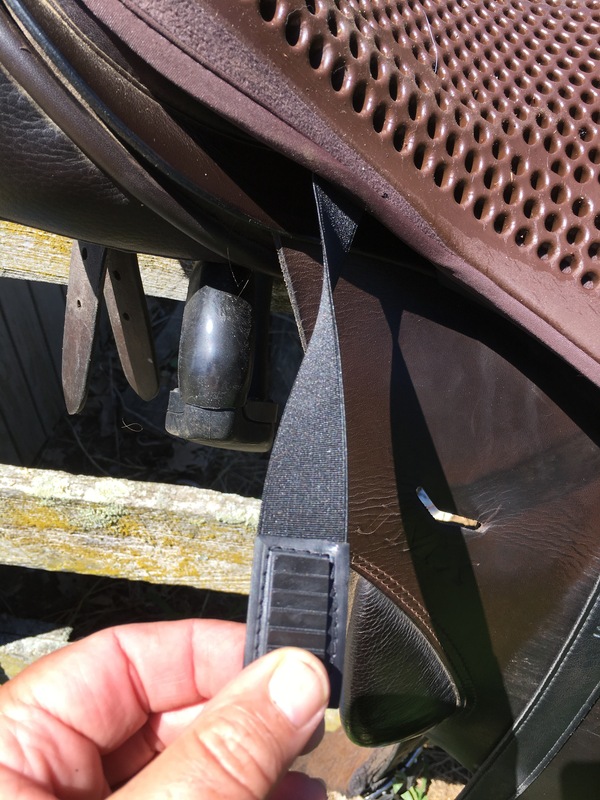 The strap should be pushed under the panel of the saddle (on each side) so that the plastic end is in the gullet. 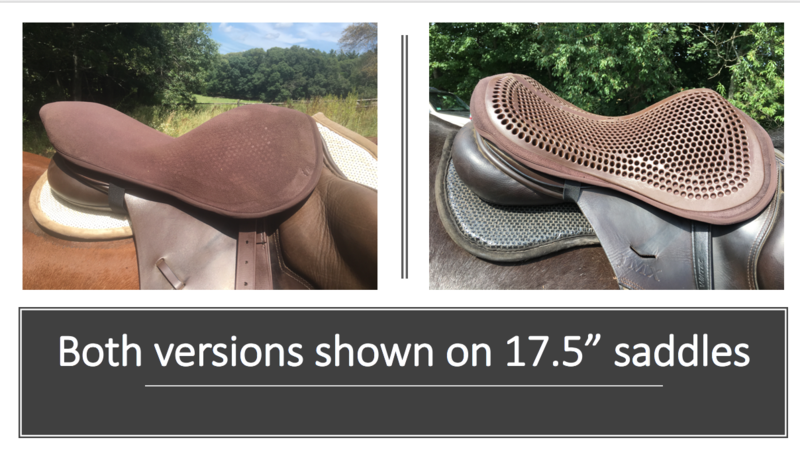 I ordered the Large size in each design, which the website says is suitable for saddles 17.5″-18″. I used this on a Kieffer Norbert Koof FL and a Jeffries JMX. The Kieffer measures at 17.25″ and the Jeffries at 17.5″. The seat savers fit just fine and could easily accommodate an 18″ saddle. The gel in pad is on my Kieffer Norbert Koof FL (left) the gel out pad is on my Jeffries JMX (right). There’s enough room that you could easily fit them on an 18″ saddle. One of my concerns was that a seat saver would take up too much room and change how the saddle fits me. Certainly, this has been a problem with seat savers in the past. It’s not a great trade off if the seat is softer but also too small! I ride in a 17.5″ -18″ saddle, so the Kieffer is just on the edge for me. Ahhh! That was my immediate response when I lowered myself onto the saddles and found cushioning! 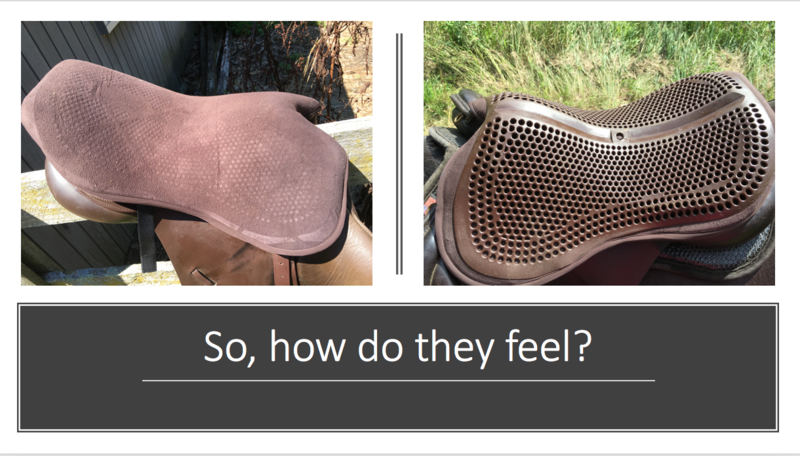 This was particularly evident with the Kieffer (German saddles are not known for being soft!). These seat savers are exactly as advertised. 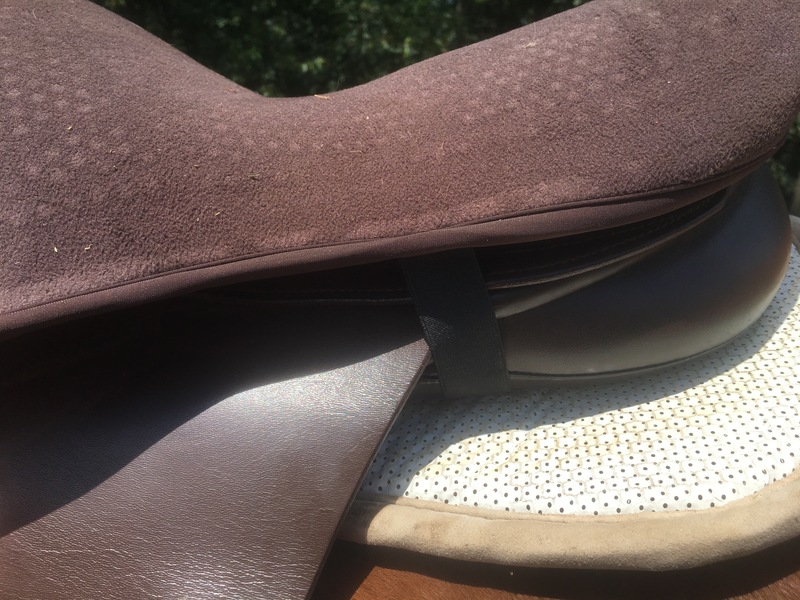 They give a delightful layer of softness that makes riding at the walk for longer times much easier on my seat bones and which would be a benefit for long rides at any gait. I can also see that they also help absorb shock and would be great for riders with back issues. The gel is definitely thicker on the Gel Out Cushion Ride (20 mm thick) than on the Gel In version 10 mm) that I received, but each provides enough cushioning to feel great but not leave you feeling perched. The gel did not make me feel at all unstable, in fact, the “stickiness” of the gel out pad is very comforting without being annoying. Note: I do not ride in full seat breeches. That might be too much security! I did not stick to the seat at a trot or canter and both seat savers stayed secure and in place. Equally important as the nice soft cushioning is that neither of the two seat saver designs changed how the saddles fit me. There’s no question that the Gel-In version of the seat saver has a more traditional appearance. I don’t mind the way the Gel-Out seat saver looks, but if you want something that blends in more or which isn’t so obvious, the Gel-In is the way to go. The sueded finish of the Gel-In seat saver isn’t that noticeable. If you are looking for a bit more security and you don’t mind the honeycomb appearance, the Gel Out is slightly more comfortable. As you can see, the brown version of these seat savers match the color of the Kieffer better than the dark brown of the Jeffries. For minimal visual impact, I’d probably order a black version for a very dark brown saddle. I was worried that the sticky surface of the Gel-Out version would attract dust and bits of hay. So far, that hasn’t been an issue. Do I recommend the Acavallo Seat Savers? Absolutely and without hesitation. I think that when I start hunting again in the fall, one of these will definitely be on my saddle. Ordering from Country & Stable was also a very pleasant experience. Their website is easy to navigate and the shipment came very promptly. At no time did I feel like I was compromising by ordering from another country. Wish I had read your post a few weeks ago. Just purchased a ThinLine seat saver. It is okay, it doesn’t seem to move around, it fits my dressage saddle (Hastilow) okay with a few wrinkles, but not sure it will really help save my seat on some long, long upcoming rides. I’ll have to report back on it. Sorry about that! I only just had the chance to ride in these. Seriously, they are incredibly comfortable. I’ve tried many others and never found them to help much. Please tell me how you like the ThinLine one after you’ve had the chance to ride in it more.